Subtitled ‘Networks, Hierarchies and the Struggle for Global Power‘, this is described as ‘a whole new way of imagining the world’ as it’s possible that we’re missing information about networks because it’s not recorded in historical archives. But what I found in this book is rather different, being a run through history in what seemed to me a disjointed way, albeit very detailed, with network diagrams and many footnotes. I found parts of it quite tedious, especially the early section detailing the research on the history of networking. If I hadn’t requested the book from NetGalley I would have not bothered reading any more. Fortunately I found some sections were more interesting (such as on such varied topics as social media, the Illuminati, the Reformation, European Royal families, the Cambridge spies, Al Qaeda, ISIS and Trump to name but a few) and I did finish the book. 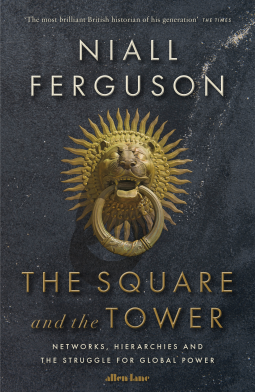 Ferguson states that his book seeks to learn about the future mainly by studying the past, in particular by looking at the importance of networks in the past that had been at times very powerful. But by the end of the book I didn’t feel too enlightened in that respect as often the distinction between hierarchies and networks is blurred – there are networks that are hierarchical and hierarchies that are parts of wider networks. As Ferguson acknowledges, the dichotomy between hierarchy and network is an over-simplification. I requested this book when I saw it on NetGalley because history is a subject that I find fascinating, and the blurb interested me. However, although there are sections that I did find interesting, mainly those written as conventional narrative history, overall I was disappointed. I think it is disjointed with sections that don’t seem to me to have much connection with the main theme, overstretching the analogy. To summarise – I don’t think such theoretical historical analysis is for me. One I can cheerfully remove from my wishlist – thanks! Oh, sorry to hear you were disappointed, Margaret. It does, if I may say so, sound a bit disjointed, and I think it’s so important that a history book ‘flow,’ if I can put it that way. It doesn’t sound as though it’s for me, either.